How worried should we be about the earthquake heading for the Pacific Northwest? Last month, The New Yorker published an article that shook us to our disaster-denying cores. “The Really Big One,” written by Kathryn Schulz, described in agonizing detail the effects of a massive tsunami/earthquake that will, perhaps soon, wreak havoc on the Pacific Northwest. Schulz presents us with a horrifying near-future: An unstoppable disaster will ravage the Pacific Northwest, and all we can do is run or wait. 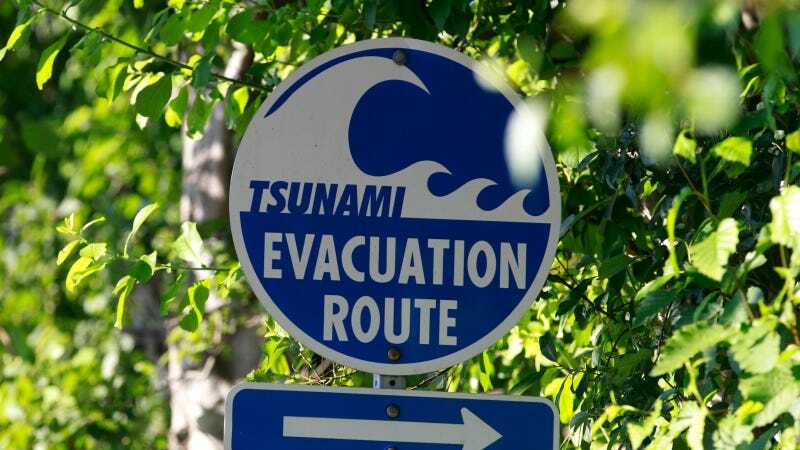 But not much attention was paid to the U.S. Geological Survey’s announcement, last week, that it would grant $4 million to four West Coast universities to support research into early earthquake warning (EEW) systems in the region, plus an additional $1 million for new EEW sensors. The University of Washington, along with the University of Oregon, the University of California at Berkeley, and the California Institute of Technology will use the money to continue to develop, and eventually implement, a system to give people a heads up before a coming earthquake. The University of Washington explained in a press release that the goal is to “help transition the prototype ShakeAlert earthquake early warning system, under development since 2005, into a public-facing tool.” Ideally, ShakeAlert would give people between thirty seconds and four minutes (depending on where they are) to head to safety ahead of a major quake. Experts quoted in the UW release also got a bit bristly. “The impression you got from the article was that the only advance warning you’d ever get would be barking dogs,” said Paul Bodin, who manages the (yet unlaunched) EEW system in the Pacific Northwest. So can we stop worrying about the really big one? Not quite, but we may be able breathe a little easier. Vidale offered two points of contention with Schulz's article—or, rather, with the way in which people reacted to the article. First, he said, it’s not accurate to conclude that a major earthquake is “overdue.” That word, he says, calls to mind a pregnancy. When a pregnancy is overdue, the chances of the baby being born go up each day. That baby’s coming out, and soon. But if we haven’t seen an earthquake when we would expect to — in this case, 72 years ago, “the odds go up only slightly.” Schulz, it should be noted, addresses this issue in a follow-up piece titled "How to Stay Safe When the Big One Comes," which offers practical advice to readers and places some of "The Really Big One's" more terrifying passages into (slightly) calming context. She stands by the odds listed in her original story, but notes that people shouldn't think about the earthquake as "overdue" in the colloquial sense. 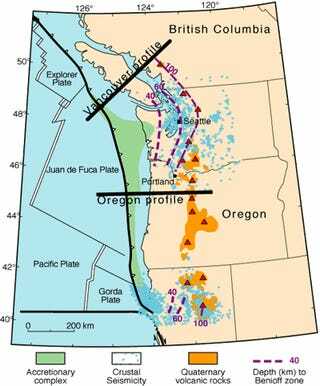 Furthermore, Vidale explains, only the southern part of the Cascadia subduction zone is past due for an event. The northern part, which is closer to the Pacific Northwest’s major cities — has caused fewer earthquakes, one every 500 or 600 years on average. That means that we’re, on average, about 200 to 300 years early for a quake in the north. “Communications may black out, transportation may grind to a halt, stores conceivably could run out of goods for a while, but that doesn't constitute "toast" in one's mind. The speaker must have been referring to some aspect of those problems, not to smoking rubble. Vidale said he's received a number of queries from concerned residents about whether or not they should leave homes in the Pacific Northwest. His answer to them is a resounding "No." Still, both Vidale and Bodin said the article is a good thing. “It definitely raised awareness, and communicated a lot of the science. It explained a lot of the problems… [and] we’re really happy to see people paying attention,” said Vidale. This week, the Pacific Northwest Seismic Network if hosting a public forum on “earthquake hazards and preparedness,” an event called “The Really Big One” Public Forum on the PNSN website and that Vidale confirms was inspired by Schulz’s piece. Unfortunately for us, many of the most frightening points of Schulz’s story still stand: It will cost $16.1 million per year to get the region's earthquake preparedness system into shape, and it's easy to see Congress shying away from the cost of preventative measures. And Bodin predicts that though the region isn't helpless, it's still not adequately prepared for a major quake. "I predict… that the next earthquake will catch us by surprise and those things we didn’t fix will break and cause pockets of misery; and that our EEW system will contribute to our response, reducing falling and toppling injuries and damage, and helping a few industries save some money getting operational quickly in the aftermath." So we may not see an apocalyptic deathscape, but we'll be far from unscathed.